In order for you to be able to choose a coffee machine that surely targets your personal needs and your family preferences, you have to deeply navigate and earnestly step into the world of coffee makers. For your convenience and satisfaction, we have presented some know-hows in choosing the best Bunn coffee makers for you. We have also curated some of the great coffee makers from Bunn along with their specifications to help you narrow down your choices and to give you some knowledge and understanding of their wide selections. In your quest to search and select the best coffee maker among the Bunn series, we made an exclusive guide, bringing you some primary factors to consider in determining the right Bunn coffee maker for you and your household. Bunn has different kinds of robust coffee makers which are made with long-lasting, durable materials. Prioritize great performance of the product and consider that you might need to spend an extra amount for something that will remain for a long time. Look for a machine that offers adaptability and flexibility if you are fond of a wide range of choices. For home coffee makers, there are many options which brew everything from just a single cup of coffee to the standard 10-12 cup range. There are also standalone units catered for single serve coffee makers. In this regard, it usually depends on each customer’s necessity. Not all coffee makers produce the same pleasant taste based on the roasted coffee scent that they emit. If a coffee maker gets too hot, it will result in a burnt taste from the heat which downgrades the authentic taste of the coffee grinds. Excellent coffee makers produce delightful coffee taste. Credibility is a crucial aspect, especially when a product is pricey. We encourage you to always make some research of the best Bunn coffee makers before purchasing. Upscale and stylish-looking products are not always the best ones. So consciously look for the product’s capabilities which defines its performance and power. Designed after BUNN’s commercial brewing systems, this modern coffee machine is accurately made for fulfilling the demands of various families and households. This is considered to be “The Original Pour-O-Matic” as it is basic black and appeared to be squared from the front of the tank, having that boxy exterior. It is taller and kind of slimmer based on its characteristics. In just three minutes, it can generate 4-10 cups of coffee which is very quick beyond other coffee brands. It is engineered to brew great tasting coffee in a flash, thanks to its constant internal hot water system but it might not be the most energy-efficient. It is easy to operate and is great for busy individuals who like simplicity and speed. It features a multi-stream spray head that secures the right water amount into the coffee. It has a proprietary lid and spout design on its carafe which guarantees that the coffee travels exactly where you pour it without the splatters down the front of the decanter or overflows on the surface of the countertop. Relish and admire the delicious goodness of fresh brewed coffee when you get this brewer for your entire family. If you have unexpected few guests coming over to your home or if you’re in the hurry to get ready for work, this is a must-have household item for you.. You will always love drinking coffee when you use this coffee machine especially now that it has an updated design that is innovated for ease and comfort. The constantly heated internal water in a stainless steel commercial grade tank brews coffee using water displacement. It can fill up an American-sized travel mug or a full pot that measures around 10 cups of coffee in less than 4 minutes. To ensure the right amount of water comes into the coffee, it carries a multi-stream spray. The exceptionally-designed carafe is composed of a lid that permits the coffee to directly flow straight into your cup without the mess. It also diminishes the possibility of coffee drips down the side. Although it doesn’t have the programmable feature, it is a good coffee maker that delivers a hot cup of coffee instantly. You just make sure it is always plugged in and always ready to bring you a delectable cup of coffee. You can enjoy your coffee time with your loved ones with this product. For your ultimate convenience and satisfaction, you need a fantastic coffee machine that offers special features and replenishes your desire in drinking a good cup of coffee like no other. 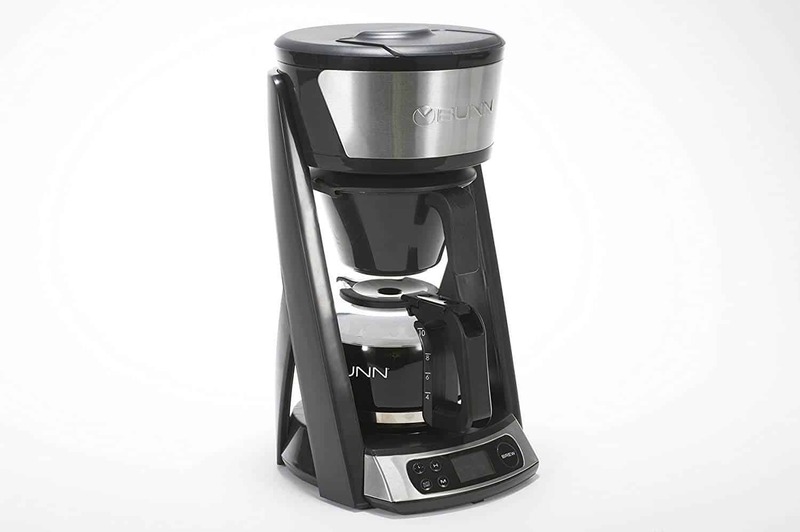 This up-to-date Bunn coffee maker is designed with “Heat N’ Brew Technology” that heats all the water in 6 minutes to the optimal brewing temperature prior to the 4-minute brewing process initiates. This coffee machine has a digital clock with programmable start time which you can set up before you sleep. This saves you some energy and allowing you to accomplish your important tasks in the morning. You can just rise and shine in happiness with the alluring aroma and great taste of a cup of coffee. It doesn’t need to stay plugged in on the counter, making it perfect for those who don’t brew every day. It also has a drip-free carafe with proprietary lid and spout design like other Bunn coffee makers to restrict overflow and incline the coffee straight into your cup. It also produces as little as 20 ounces to a travel mug or a full pot. The auto warmer plate turns on during the brewing process and off after 2 hours. There is a water indicator and an economic-style sprayhead for flawless coffee extraction and ideal flavor. Built with an unparalleled technology and contemporary design, give this Bunn coffee maker a space in your kitchen area. 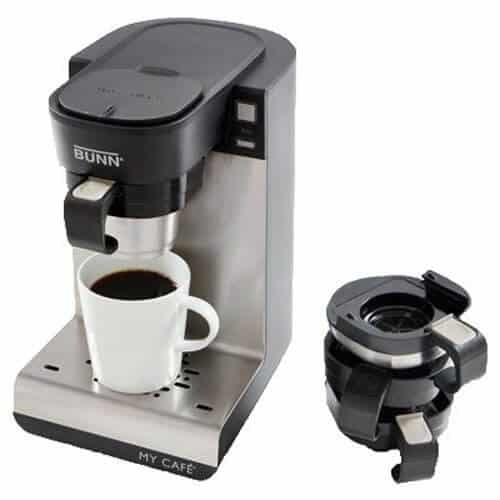 If multifunctionality is your priority, this versatile product from Bunn is one of their best-selling coffee makers. This well-rounded coffee machine is made to serve one cup of coffee at a time and we like to remind you that it’s not just for coffee because you can absolutely brew your favorite type of tea with this gadget. A big yes for this multipurpose item because it offers a variety of selection with the 4 interchangeable drawers, giving you the flexibility to use coffee pods, K-cups, ground coffee, tea bags, and even your own loose tea. There is also a separate drawer where you can dispense hot water for your hot chocolate or your breakfast oatmeal or even heart-warming soup to brighten up your day or night. The product also has a ground coffee drawer so you can ground coffee and brew dark roasts and decaffeinated drinks. It is super easy to use and has a brewing time of less than a minute. The stainless steel hot water tank maintains the perfect water temperature for top quality flavor extraction. It also introduces a Pulse Brew option which gives you a richer taste of coffee or tea. This particular single brewer from Bunn is designed ingeniously for people who are fond of an all-around selection. Mainly designed for the office and business environment, this beautiful coffee maker from Bunn is also created for people who always organize small parties, gatherings, or for special events as it has the capacity to brew 14.4 liters of perfect coffee per hour. Constructed from stainless steel internal components, it is a high quality and long-lasting product. If you observe its edge carefully, it has an elegant black finish that greatly enhances the ambience of the area. It bears both an upper and lower heating deck to keep brewed coffee warm. It can be moved anywhere because it doesn’t demand plumbing which is a typical requirement for several commercial coffee brewers out there. This large coffee maker is a piece of cake when it comes to operating it because you just simply pour some water and it eventually provides you a wonderful taste of coffee, making you feel inspired and empowered while working. This is an impressive Bunn coffee maker suitable for commercial purposes and even for people who often host small gatherings in their homes. To end up this article, we choose Bunn coffee makers because this world-class brand profoundly manifests credibility and authenticity in every aspects of their products. Since 1850s until now, the company’s product and equipment innovation solutions have dramatically revolutionized into greater opportunities to provide the needs of customers in the world. After making some extensive research for the best Bunn coffee makers, BUNN CSB2G Speed Brew Elite Coffee Maker is our Top choice among all the Bunn coffee makers due to its strong and credible performance, fastest brewing time. It is also the most remarkable, standard-priced Bunn coffee maker that has an elegant and polished design that serves as a space saver as well. It is ideal for your home and for small commercial areas.